Evaluating autism information is tricky, especially on the Internet. How can we differentiate between helpful and harmful information? Why is questionable autism information dangerous? And why is it that autistic people's perspectives are so crucial to understanding autism? Since I am a chronic worrier, I thought only a handful would show up. But the session was full, and people had lots of questions—plus many really wanted a record of the talk. So, here are the topics I covered, and please let me know if you have any questions. Main takeaway: You, your students, and your child deserve to lead good lives. 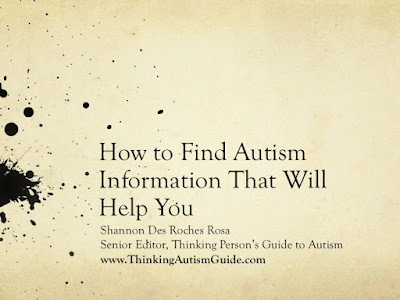 If you heed bad autism information, you will never learn what autistic people actually need and deserve, and everyone involved will miss the opportunity to achieve the best lives possible. I am the senior editor and co-founder of Thinking Person’s Guide to Autism: A website, book, and community of parents, autistic people, and professionals. Please learn from my mistakes, so you don't make the same ones. You need to find tools that will help you and/or your family live the lives you all deserve. It's ok and necessary to acknowledge when things are hard, and why. Our society is unfriendly to autistic people. This is unfair. This is why we’re here today. Historical and cultural understanding and acceptance of autism vary. But in the U.S., information is often flawed or wrong. Autism is mostly inherited. Many parents are undiagnosed, or have some autistic traits. So, remember self-compassion. Critical thinking skills help, a lot. “Person with autism” vs. “autistic”: respect the language people use for themselves, also be mindful of when its appropriate to derail important discussions because of language. Who do you trust, if you’re new to autism? Autism professionals: Have experience with populations. But not necessarily a true understanding of autistic experience. Autistic people: Lived experience. Valuable if your loved one/client/student is non-speaking, and/or you are newly diagnosed. Is this practitioner or vendor promising miracles that no one else seems to achieve? Is the person also asking for money? Does scientific research support their claims, or are there only individual (often emotional) testimonials? Does the approach aim to help, or to control? Whose interests does the approach serve? Hi! I just wanted to let you know that I found your blog through reading the book "Neuro Tribes" and wanted to let you know that Leo totally reminds me of my 6 yo Ava who's nonverbal and has moderate Autism. Ava must be completely awesome, in that case. All the best to you both.